Special Envoy Martin Griffiths (2nd right) speaks at a press conference in Sweden, alongside Swedish Foreign Minister, Margot Wallström (2nd left). 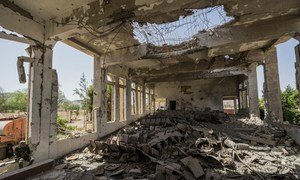 The Yemeni Government and the Houthi opposition have gathered at United Nations-sponsored political talks, close to the Swedish capital, Stockholm, aimed at ending nearly four years of brutal war in the country. Special Envoy Martin Griffiths, the senior UN official facilitating the talks, said that the resumption of the political process, after two-and-a-half years, is an “important milestone” and the presence of the two delegations shows that they are ready to work together. "Let us be in no doubt that Yemen’s future is in the hands of those of us in this room", he told delegates adding that "the country’s institutions are at risk, the fragmentation of the country is an enormous concern and we must act now before we lose control of the future of Yemen." 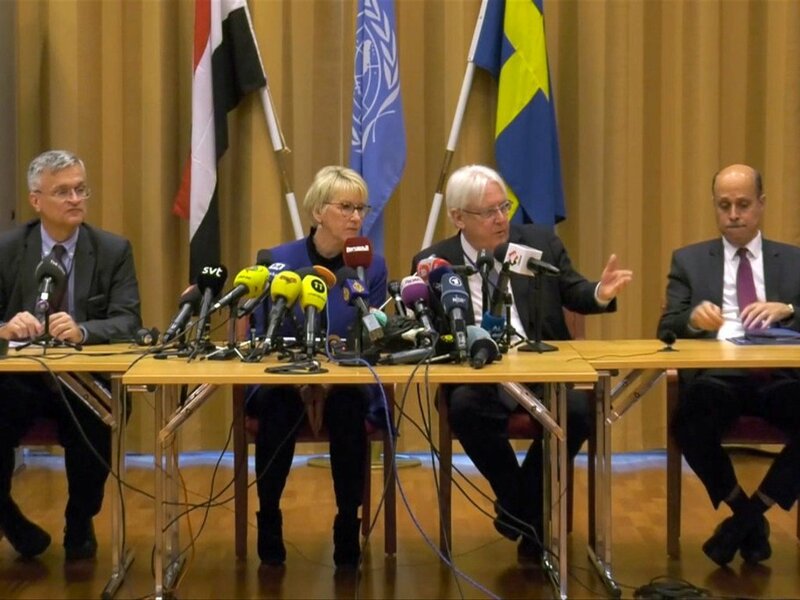 Later, he added that being together in the room demonstrated “to each other, and most importantly to the people of Yemen that you are ready to come together in the name of a peaceful political solution to the conflict,” Mr. Griffiths declared, addressing a press conference alongside representatives and the Swedish Foreign Minister, Margot Wallström. Secretary-General António Guterres welcomed the consultations and urged the parties to make progress “by exercising flexibility and engaging in good faith and without pre-conditions”. The grinding war has left over three-quarters of the country’s people reliant on international assistance and protection, and millions “severely” food insecure, marked by rates of very high acute malnutrition and excess mortality. The dialogue will also be a “critical opportunity” to move the peace process towards a comprehensive agreement based on what diplomats refer to as the “three references” – the Gulf Cooperation Council initiative to try and create and deliver a peace framework, outcomes of the national talks, and relevant Security Council resolutions, including resolution 2216, stated Mr. Griffiths. “In the coming days,” he said, the two sides “will have the opportunity, to discuss and make serious progress, I hope, on a framework for negotiations that sets the parameters for the peace agreement and the resumption of the political transition,” he added. Efforts will also focus on Yemen’s deteriorating economy, violence in the key port city of Hudaydah - which is the crucial hub for food and aid imports on the Red Sea - and other parts of the country. Access and the resumption of flights in and out of Sana’a airport will also be discussed, as well as improving humanitarian access and making relief programmes more effective. Mr. Griffiths also told reporters that an advisory group comprising eight leading Yemeni women, as well as other Yemenis with experience in political issues, would be a key part of consultations moving forward, at his invitation. “Already they are telling me how to move forward and what to do and what not to do,” he said. Also at the talks will be the Ambassadors, accredited to Yemen, from a number of countries, as well as representatives from the international community. Concluding his statement, Mr. Griffiths stressed that all those present in Sweden, for the talks, have “all expressed” their commitment to a political solution. “The coming days are a milestone, it is an important event, a significant event, do not waver, let none of us waver in spite of the challenges we may face. Let us work with goodwill, good faith and with energy and conviction and we will deliver a message of peace to the people of Yemen,” he told those assembled. Since the conflict escalated in 2015 with the beginning of an air war backed by a Saudi-led coalition - thousands of civilians, including many hundreds of children, have been killed as a direct consequence. Many more have lost their lives to malnutrition and deadly diseases such as cholera.